This is my 1935 Mauser C96. It is the pride of my antique firearm collection, but it has little actual collector value because the serial numbers do not match, the inside of the barrel looks like a sewer pipe, and I recently had to replace the rear sight. I enjoy shooting it, but it is not a good shooter in its current condition. That in mind, I’ve been toying with the idea of having it restored to its former glory. I do like the patina but looking at restored pistols like Lugerman’s impressive example is making me ponder the possibilities. Questions: Would it be worth the investment to restore this pistol? If so, are there any other options besides Lugerman? Or would I be better off just leaving it with its current patina and character? How much value is lost if it is partially modern restoration? Sounds like it has already been reassembled from parts before you bought it and lost much of its value. Since much value as a collector’s piece is lost, I would restore it to best firing condition possible and enjoy using it. Your restoration will improve both its appearance and its accuracy. Its collector value is probably a non-issue since it is assembled from multiple weapons and already has new modifications. I am assuming you don’t want to add anything to it that would not have been on the original. Only if you’re going to dress up in period costume and have a real duel. @anartist, you are on a hell of a roll tonight. The barrel assembly and most of the parts has one serial number, while the frame and bolt stop has another serial number (which is only a few digits off of the first). It is shootable, but it needs to have some barrel work if I want to be able to hit a bale of hay at 10 yards. That’s partially why I was thinking about having it restored, since most collector value in these guns comes from the external appearance, condition of the bore, and matching serial numbers. I’m probably going to take your advice. @Coloma, sorry dear, but traditional dueling had long since died out by the time this gun was invented. I am prepared for a duel, should the need arise though. That is one COOL duel ( ing ) pistol! Whats the era? I’m for always keeping old equipment as original as possible, regardless. Have it worked on, but not completely fabricated/moded. Seems to me yours is decidedly a collector, not a shooter. If you want a shooter buy a reproduction or use one of your various other pistols. Keep old stuff old, I say; even if the work is provided free. Yes, in my opinion, restoring an object from the past is a worthwhile project, as long as it is done as authentically as possible by a professional. @ipso, that’s another thing I keep hearing. They don’t make modern reproductions of this particular weapon (the machining is so complicated that they would cost thousands each and wouldn’t be cost effective). I’m actually thinking about just buying another one in 90%+ condition. It would be way more expensive, but I wouldn’t have to alter this one. @YARNLADY, it would definitely be restored to its original specs if I did indeed have it restored. I’m starting feel like keeping it with its patina is a better option though. These things are like old guitars: the ownership permutations and “meaning” are endless. Sounds like fun! My dream gun would be one of the .45 Lugers (of course). I’d even love to have a reproduction as a shooter. The top action and feel is just so unique. I’d like to try one head to head with the Glock 21 and custom 1911 – for about a decade. @ipso, I had no idea they made any .45 Lugers, that is too cool. The Chinese actually made Broomhandles in .45. I’d love to have one of those. 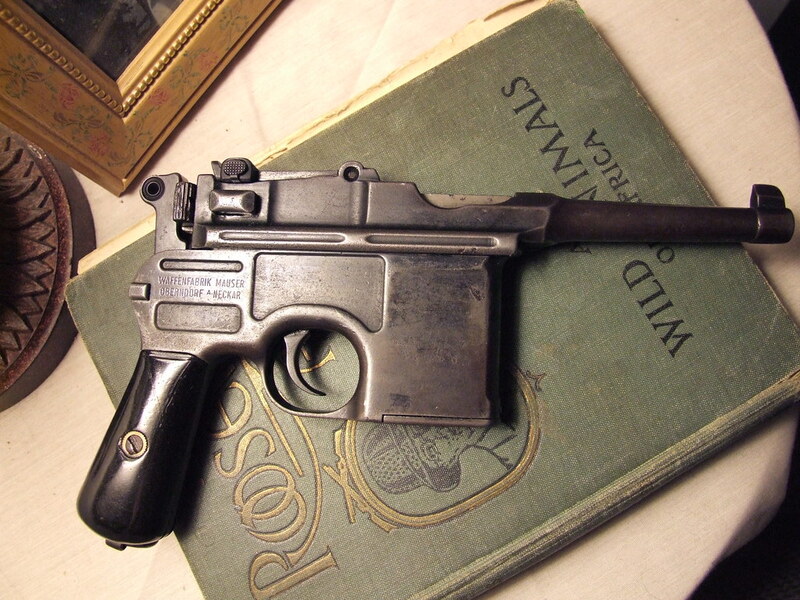 I think I may actually get a Luger as my next vintage pistol, if I don’t get a better condition C96. What about buying more parts and finding a good machinist/gunsmith to make them fit together perfectly? Is that part of what is wrong with yours now? Are the mismatched parts a little off? @anartist, nope. The mismatched parts have no effect on the appearance, fit, or function of the gun. The parts for these guns were made to rigorous specifications and are all mostly interchangeable among individual weapons. Part of determining any collectible gun’s value is whether or not the serial numbers on all serialed parts match. If the numbers don’t match, the value decreases because the weapon is not in its original configuration, but it will still likely function and fit together correctly as long as the parts were massed produced. The only real problems with mine is the rifling in the barrel is barely visible, which greatly reduces accuracy (and is a pretty common problem with these specific pistols, since most of them weren’t cleaned properly before being stored for 70+ years). My finish is well worn and there is some pitting on some of the metal parts. Other than that, it looks good and is perfectly functional. I think I have decided to leave it be and just save up for another example in excellent condition. That way, I’m not screwing with the history or patina of this gun, and I’ll have another one which looks and shoots like it was brand new. If the rifling is worn down would you have to do something fairly extreme like relining and re-rifling the barrel because it has lost metal? I realize that they were all machined to specifications, but could different parts have endured different circumstances that may have changed them in different ways? @anartist, no, the parts are all still up to spec except for the barrel. The only parts that experience any wear during continued operation are the firing pin, some springs, the bolt, and hammer. All of those parts are in pretty good shape comparatively. The barrel would have to be relined if I restored it. I may actually do that anyway without restoring the rest of the pistol just so I can shoot it accurately. I literally cannot hit a 3×5 foot target at ten feet with the barrel in its current state. Relining the barrel costs about $200 and it doesn’t visibly alter the gun in any way. I think this may be a safer option! @Coloma believe it or not,this yogic/holistic method works [I have one and really need it]. It Has spread beyond the yoga subculture and is widely used in Europe. @Coloma, yup. Small amounts of capsacin (sic) present in peppers will really loosen up your congestion. Too much and you wind up like someone who just got pepper sprayed, though. Oh yeah..use it all the time, but, sometimes it gets out of control with the allergie scene. @Coloma, no worries! I encourage banter, even if this is in the general section. I like you kiddo…my kinda fun, open, personality! @Coloma, aww, I like you too! Let’s be friends. @Coloma, no way Bill Cosby! I had oatmeal for breakfast, but..the fudgcicle is partly medicinal, it feels good pressed up against my forehead! @Coloma @Fiddle_Playing_Creole_Bastard awww. how cute.